Justin Gatlin wins the final 100m race of this year's Diamond League series by a tiny margin ahead of Qatar's Femi Ogunode in Brussels. Gatlin and Ogunode were both given a time of 9.98 seconds, but Gatlin got the nod to be crowned overall Diamond League champion. 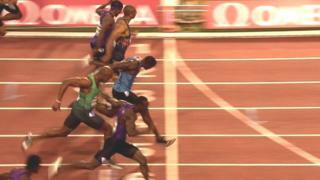 Briton Chijindu Ujah finished eighth in a time of 10.19.